A snowy alms along Jewett Creek en route to White Salmon. February 2019. Starting April 2, the monks will offer a weekly one-hour silent meditation period for experienced meditators. It will be held 5:15 – 6:15 PM, just prior to the regular Tuesday night community meditation and Dhamma talk at Yoga Samadhi, White Salmon, WA. This earlier, hour-long sit will be completely silent (no instruction). Participants are expected to be seated and ready to meditate by 5:15 PM and to stay until 6:15 PM. If you arrive late or have to leave early, please come another time. The regular Tuesday night community meditation, 6:30 PM – 8:00 PM, remains open to all levels of meditation experience. During this time period the monks give brief instructions before meditation, offer reflections on the Buddha’s teachings and usually have time to answer questions. Offered free, at Yoga Samadhi, White Salmon, WA. Cushions and chairs available. Starting in April, monthly Garden Parties (community work parties) and PFoD visits return. The former monthly half-days of meditation will not be returning. Note: Upasika Renewal is also on Sunday, April 21 at PFoD, 12:30-4:30 pm, after Sunday Sila. See PFoD for more information. 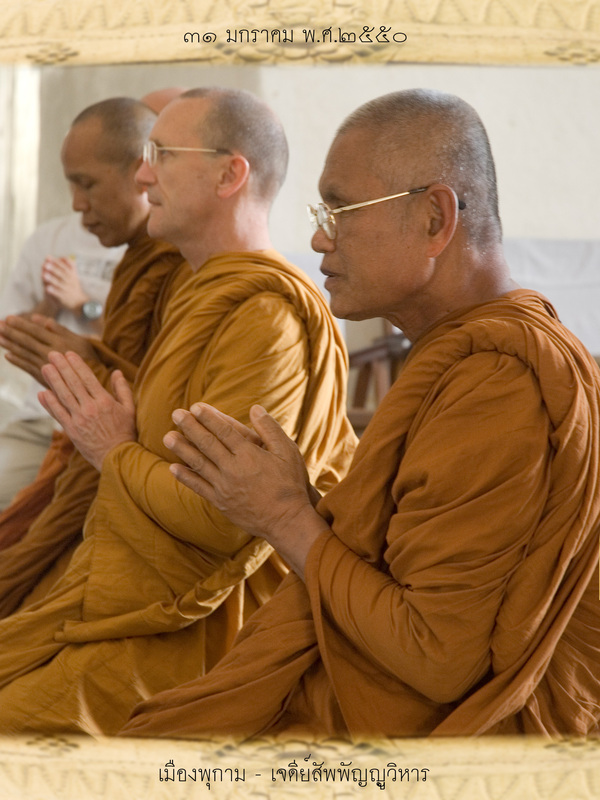 Ajahn Sudanto will be away Mar. 20 – Apr. 11 and May 1 – 16 for the Birken Retreat. Ajahn Kassapo and Venerable Kovilo will be returning to Abyahagiri in late March and late April. Replacing them from Abhayagiri will be Venerable Khantiko and Venerable Gunaviro. 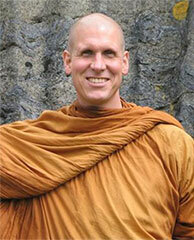 Ajahn Jotipalo will arrive late April to visit for several weeks. On September 20, supporters will hold a traditional Thai Buddhist alms-giving ceremony called a Pah Bah (pronounced paw-baw) in support of and gratitude for the Buddha’s teachings as well as the spiritual practice, example and teachings of the monastics at the Pacific Hermitage. 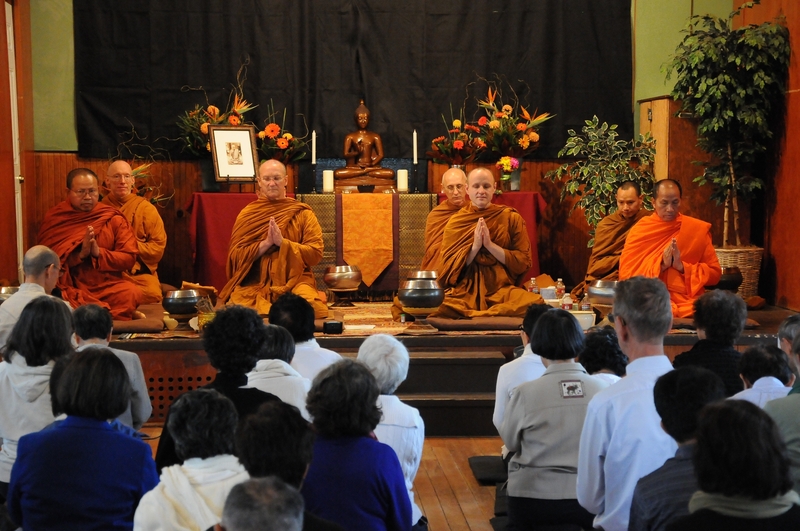 Each year since 2010, supporters have sponsored a Pah Bah to help support the Hermitage and provide for the monks in residence at this small monastery in White Salmon, Washington. All events will be held at Mt. View Grange, 1085 N. Main Ave., White Salmon, WA 98672. Everyone is welcome to come to all or just some of the events. There will be a half-day meditation retreat on Saturday, the day before the Pah Bah. On Sunday, there will be a potluck meal offering, Dhamma talks, chanting, the alms-giving ceremony, tours and tea with the monks. The events are free. You are welcome to make a donation, but it is not necessary. Meditation Retreat (1 – 4 PM) — Walking and sitting meditation, with some Dhamma discussion (questions, answers and discussion of the Buddha’s teachings). Chairs and some cushions available, but you’re encouraged to bring your own cushion if you have one. Potluck Meal Offering (arrive by 10:30 AM) — Bring a dish to share with the monks and other supporters. The meal offering begins at 11:00 AM. Ceremony, Chanting and Dhamma Talk (1:00 – 3:00 PM) — The Abbot of Abhayagiri Monastery (California), Luang Por Pasanno, and Abbot of the Pacific Hermitage, Ajahn Sudanto, will preside. Since the Hermitage is part of the Thai Forest Tradition and many of those attending will be Thai, much of the ceremony will be done in both Thai and English. 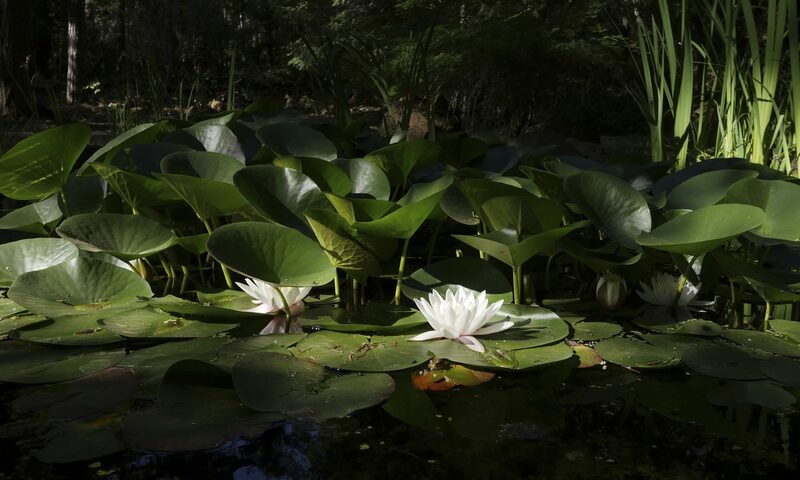 Tea with Monastics and Hermitage Tours (3:00 – 4:00 PM) — You are welcome to tour the Hermitage or have an informal tea with the monastics after the ceremony and Dhamma Talk. If you are interested in donating money or material goods, please visit sanghata.net or email: pahbah@sanghata.net. Donations may also be made at the Pah Bah event.